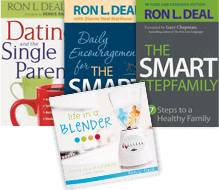 Are you part of a blended family? These resources were made just for you. FamilyLife Blended® provides timeless wisdom and practical help and hope for blended families and those who love them. Join Ron L. Deal, LMFT, LPC as he and his guests discuss a wide variety of marriage, family, and relationship topics related to blended families. For longer, more in-depth broadcasts about blended families, remarriage and stepparenting, go to FamilyLife Today and click on the Blended Families button. For blended marriages and families. Created for couples in their first year of marriage. You don’t have to be an expert, but the more you learn about blended families the better mentor, coach, and advisor you will be to both students and their parents. Specifically for military blended marriages and families. Check out our online shop for more great resources.